Vintage - Elizabethan Fine Bone China, by Taylor & Kent. 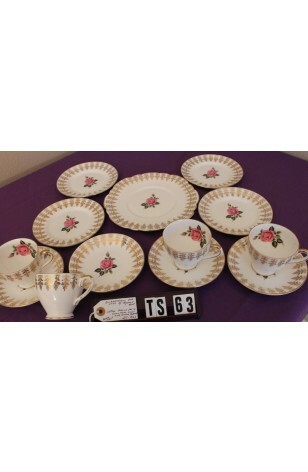 Pink Rose & Rosebud, with 22kt Gold Filigree, 14-Piece Tea Set, Circa 1930's. This beautiful Elizabethan Fine Bone China Tea Set by Taylor & Kent Consists of a Bright White Background, Very Dramatic Pink Roses and Rosebuds at the Center of this set. Also includes an enormous amount of 22kt Gold Filigree. Tea Cups and Creamer are Footed, with 22kt Gold Trim & Handles, and Rose Print on the inside of the cups. All Rims of Plates and Cups have 22kt Gold Trim. Lovely to show at anytime... Beautifully Hand Painted. In Great Resale Condition unless noted below or in pictures.